Transform piles of socks, undergarments, pantyhose, and scarves from cluttered chaos to tidy order with this set of two versatile drawer dividers. Constructed of handsome natural wood, the dividers serve to create multiple compartments within a dresser or bureau drawer--with no cumbersome hardware or tricky installation required. Clever spring-loaded mechanisms allow the units to expand from 12 to 16 inches, which means they'll fit snugly into most standard drawers and can be moved, removed, and adjusted as needed. Additional highlights include non-skid rubber pads for slip-free use, as well as a clear lacquer finish that can be wiped clean with a soft, damp cloth. Designed especially for bedroom use, the dividers also make a wonderful addition to kitchen or bathroom drawers in need of a little organization. Each dresser drawer divider measures approximately 4 by 12 by 4 inches. 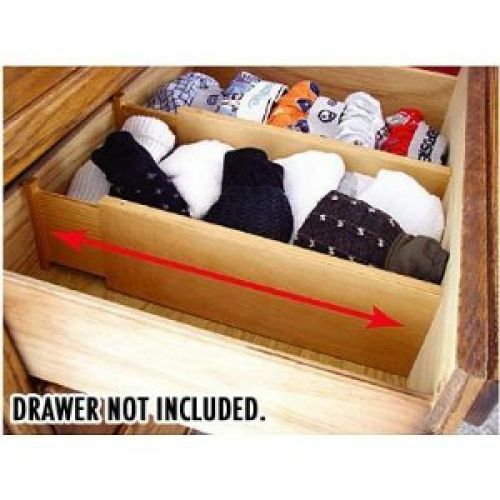 Keep your drawers organized and tidy by separating socks, undergarments and intimate apparel. Finally there is a way to organize your dresser with a custom, built-in look. The dividers, which come in sets of 2 expand from 12 inches to 16 inches, and are equipped with non-skid rubber pads and are spring-loaded to ensure a tight fit, and tool-free installation. Beautiful hardwood constructions with clear lacquer finish are easy to clean.